The following list contains the 10 tallest dams in the world. Other methods of comparing dams is by their volume or by the volume of the reservoir they create. 1. Nurek Dam, Tajikistan – 300 m (980 ft). The tallest dam in the world, located on the Vakhsh River is an earth-fill embankment dam. Construction of the dam began in 1961 and was completed in 1980. 2. Xiaowan Dam, China – 292 m (958 ft). An arch dam on the Lancang (Mekong) River. The primary purpose of the dam is hydroelectric power generation and it supports a 4,200 MW power station. Constructed between 2002 and 2010, it is the world’s highest arch dam at 292 m (958 ft). 3. Grande Dixence Dam, Switzerland – 285 m (935 ft). A Concrete gravity on the Dixence River. At 285 m (935 ft) high, it is the tallest gravity dam in the world. Its primary purpose is hydroelectric power generation. The dam fuels four power stations and generates enough to power 400,000 households. 4. Inguri Dam, Georgia – 271.5 m (891 ft). A hydroelectric dam on the Inguri River in Georgia. The world’s second highest concrete arch dam. 5. Vajont Dam, Italy – 261.6 m (858 ft). A disused dam, completed in 1959 in the valley of the Vajont River, 100 km north of Venice, Italy. 1963 (9 October) landslide caused the overtopping of the dam and around 2,000 deaths. The overtopping was caused when the designers ignored the geological instability of Monte Toc on the southern side of the basin. Warning signs and negative appraisals during the early stages of filling were disregarded, and the attempt to safely control the landslide into the lake created a 200-meter tall wave (ten times higher than predicted) that brought massive flooding and destruction to the Piave valley below, wiping out several villages completely. 6. Manuel Moreno Torres Dam, Mexico – 261 m (856 ft). An embankment dam and hydroelectric power station on the Grijalva River. After renovations, the hydroelectric power station is currently the largest in Mexico. The dam was designed in the early 1970s and constructed between 1974 and 1980 under topographical and geological constraints. 7. Nuozhadu Dam, China – 261 m (856 ft). An embankment dam on the Lancang (Mekong) River. The dam creates a reservoir with a normal capacity of 21,749,000,000 m3 (17,632,000 acre·ft) at a level of 812 m (2,664 ft). The purpose of the dam is hydroelectric power production along with flood control and navigation. 8. Tehri Dam, India – 260.5 m (855 ft). The highest dam in India. It is a multi-purpose rock and earth-fill embankment dam on the Bhagirathi River. Its main purpose is electricity generation and it withholds a reservoir for irrigation and municipal water supply. 9. Mauvoisin Dam, Switzerland – 250 m (820 ft). A concrete arch dam across the Val de Bagnes. Initial construction on the dam commenced in 1951 and was completed in 1957, with the reservoir filling by 1958. In 1991, the dam was raised to increase the capacity of the reservoir for winter storage. The dam’s primary purpose is hydroelectric power generation. 10. 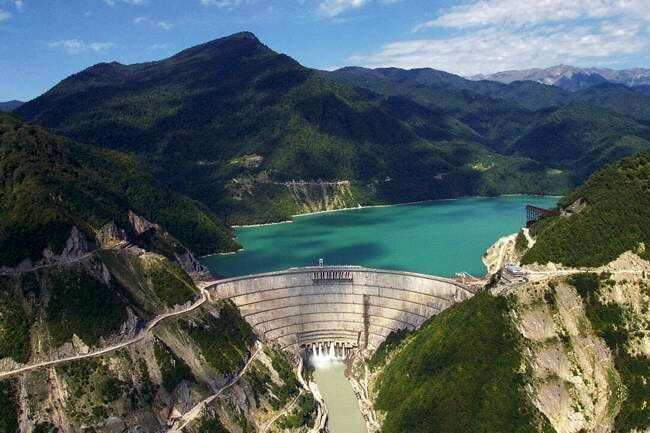 Laxiwa Dam, China – 250 m (820 ft). An arch dam on the Yellow River. The main purpose of the dam is hydroelectric power generation and has a capacity of 4,200 MW.